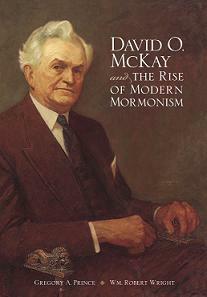 I just finished Prince & Wright's David O. McKay and the Rise of Modern Mormonism . Everyone should read this book. In the meantime, here are a few passages that stirred something within me. Well aware that knowledge brought risk, McKay's response was to manage the risk, not proscribe the knowledge. Noting the "young man who, as his immature beliefs fall from him one by one, finds himself substituting science for religion, and the scientist for God," his response was to add religion as a refining influence on the young scientist, not caution him to retreat to safer ground. "Do you remember when you first went through the House of the Lord? I do. And I went out disappointed. Just a young man, out of college, anticipating great things when I went to the Temple. I was disappointed and grieved, and I have met hundreds of young men and young women since who had that experience. I have now found out why. There are two things in every Temple: mechanics, to set forth certain ideals, and symbolism, what those mechanics symbolize. I saw only the mechanics when I first went through the Temple. I did not see the spiritual. I did not see the symbolism of spirituality. Speaking plainly, I saw men, physical state, which offended me. That is a mechanic of washing ... I was blind to the great lesson of purity behind the mechanics. I did not hear the message of the Lord, "Be ye clean who bear the vessels of the Lord." I did not hear that eternal truth, "Cleanliness is next to godliness." The symbolism was lost entirely ... And so with the anointing, following the washing. Do you see the symbolism? ... How many of us young men saw that? We thought we were big enough and with intelligence sufficient to criticize the mechanics of it and we were blind to the symbolism, the message of the spirit. And then that great ordinance, the endowment. The whole thing simple in the mechanical part of it, but sublime and eternal in its significance." Johnson: "Mr. President, this is Lyndon Johnson ... I am an old friend of yours. I don't know whether you remember me or not, but you've been receiving me every time I come out there." McKay: "I remember you very well. I'm glad to hear your voice too." Johnson: "I wonder if you feel like coming down to Washington and see me sometime in the next week or two? ... I don't have any emergency, but I just need a little strength, and I think that would come from visiting with you an hour or so."